A new printable PDF eBook is available. It's about 5 jazz blues studies to master guitar arpeggios. 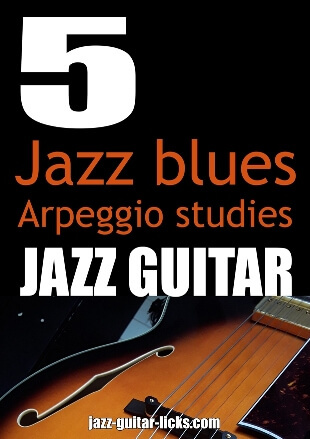 These five etudes will help you to master the use of arpeggios over a jazz blues progression. As discussed in this eBook, there are different kinds of jazz blues progressions. The one that is used in this eBook is built with a secondary dominant (VI7), a passing diminished (#IVdim7) and a turnaround (I7, VI7, IIm7, V7). In this booklet you will learn how to play dominant 7 arpeggios, minor arpeggios, diminished arpeggios. How to apply the 3-9 concept. How to use major and diminished triads and how to extend arpeggios with extra notes as 13th and a 9th.